Disclosure: The majority of links on this site are affiliate links and we earn from qualifying purchases. The majority of the links on this site are affiliate links and we earn from qualifying purchases. I like to compare the Singletrailer to a high-end race bike. It is pricey, but there is no other trailer with comparable performance. Like a high-end race bike, its lightweight and high-tech construction makes it possible to ride much faster. The single wheel and suspension enable the carriage to flow through berms and float gently over rocky terrain. Also like a high-end race bike, unfortunately, this trailer requires work to keep it well maintained. The most capable off-road trailer on the market. Enables cycling experiences that would otherwise be impossible. Learning curve with use (e.g. attaching, mounting/dismounting, handling). Harder to use for small-sized people. Does not function for other purposes (e.g. jogger, stroller, skiing). 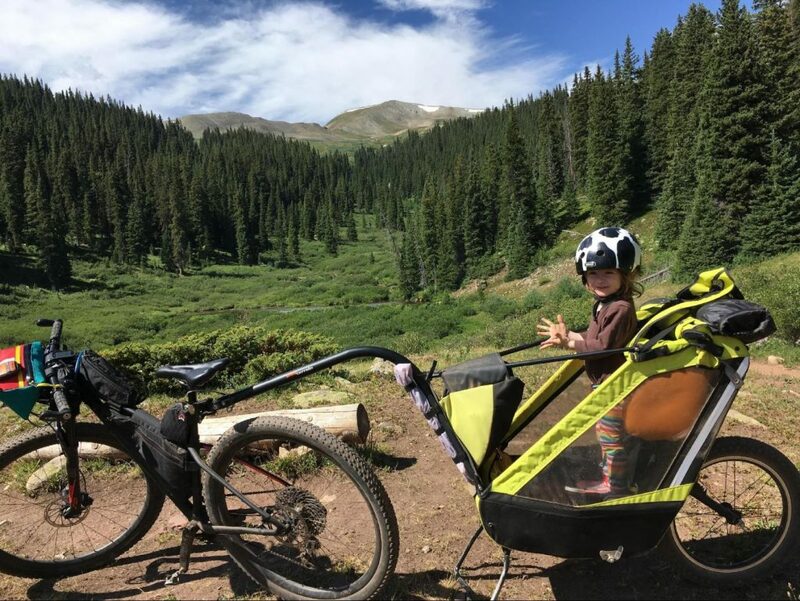 After riding over 3,000 miles in our conventional 2-wheeled trailer, we found that it was capable of handling bike path, paved road, smooth gravel roads or even some double track or mellow jeep roads very well. However, trails with uneven surfaces, large rocks or narrow tracks were impassable and we often felt limited. Including my daughter in my long rides up into the mountains was not even feasible. This meant that I had to choose between spending time with my daughter and spending time on the bike. As a result, my guilty feelings meant that I rode my bike less. This made me feel cranky and resentful. Despite the price, the Singletrailer seemed like the solution we needed. 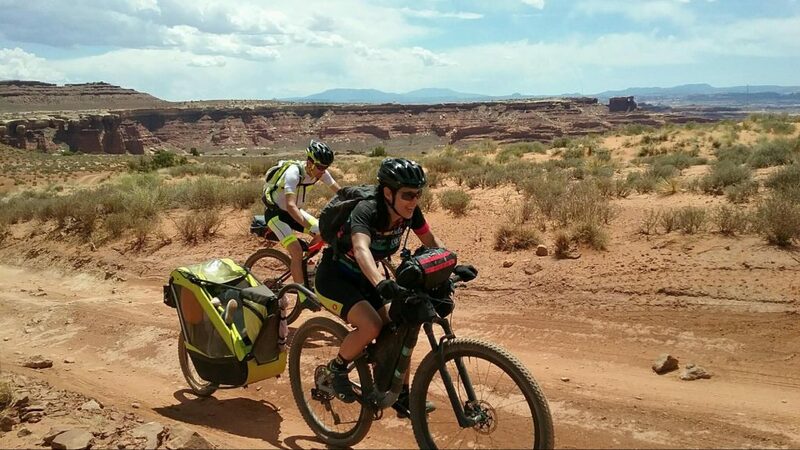 It has provided unforgettable experiences for us including tikepacking (bikepacking with a toddler) the White Rim Trail as a family. After over 1,500 miles of use, the Singletrailer has provided our family with such amazing experiences. We definitely feel that it has been well worth the financial investment. The carriage is less than 18 inches wide (narrower than your handlebars) and sits on a single wheel. The light weight (about 20 pounds) and low rolling resistance of the single wheel take substantially less energy to pull than our conventional 2-wheeled trailer. 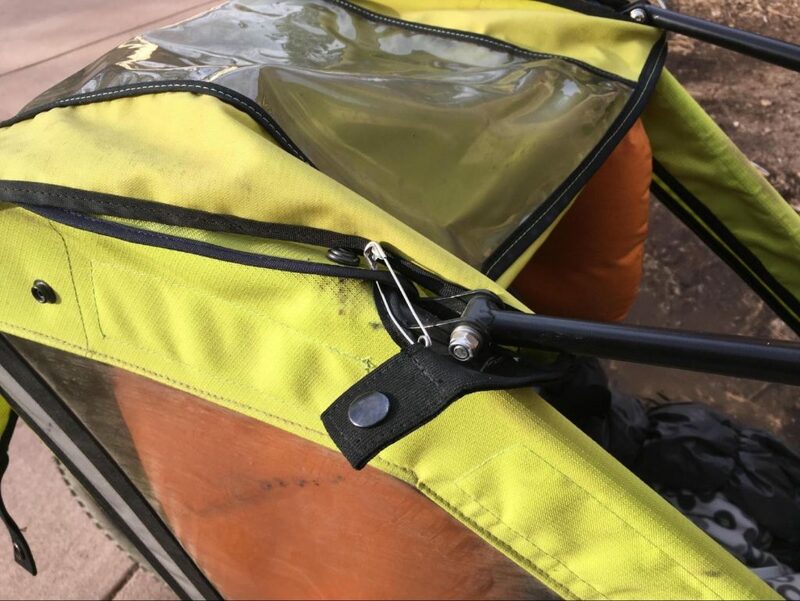 The carriage attaches to your bike using a tubular hitch. 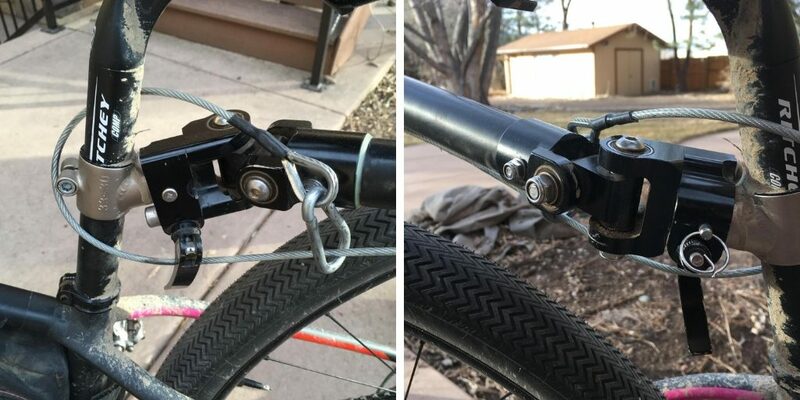 To attach the hitch, you must remove your seatpost from the bike, and then slide the hitch onto the end of the seatpost. To simplify this process, we purchased several hitches so that they could remain on our seatposts full time. Once the hitch is attached, you must attach the coupling of the Singletrailer to the hitch. The coupling is attached to a universal joint, which connects it to the end of the carriage’s long, curved tow bar. The coupling slides into the hitch and is secured in place by a quick release clamp. It is additionally secured using a simple pin held in place with a thin metal loop. As a third layer of security, a cable loops around the seatpost. This setup will fit on most bikes, including 29ers. It is advisable to use a thicker walled aluminum seatpost (avoid carbon). This system will not work with most dropper posts, although my husband has found a way to be able to use his. The single trailer has a shock providing 8 inches of suspension travel. It is unbelievable just how capable this suspension is. The trailer can roll over rocks, stairs and curbs smoothly. It glides over demanding and technical terrain with little impact to the handling. There are a few learning curves with the Singletrailer. First, getting the Singletrailer onto and off its folding kickstand takes a bit of practice. Once it is on its kickstand, it lifts your bikes rear wheel into the air. On level ground, it keeps the carriage securely in place as well as your bike. On uneven ground or ground with a bit of a slope, this must be done with a bit more care. Second, figuring out how to keep the carriage balanced on the single wheel as you mount and dismount the bike. Third, is figuring out how to properly attach the tow bar to your bike’s seat post. If this is not done precisely, it could be dangerous. The tow bar must be aligned perfectly centered to the seat post. There is no objective way to align the bar correctly. Instead, you have to “eyeball” it by keeping your rear tire in-line with the tow bar. If attached even slightly askew, it causes the carriage to lean to one side causing a dramatic impact on the handling. 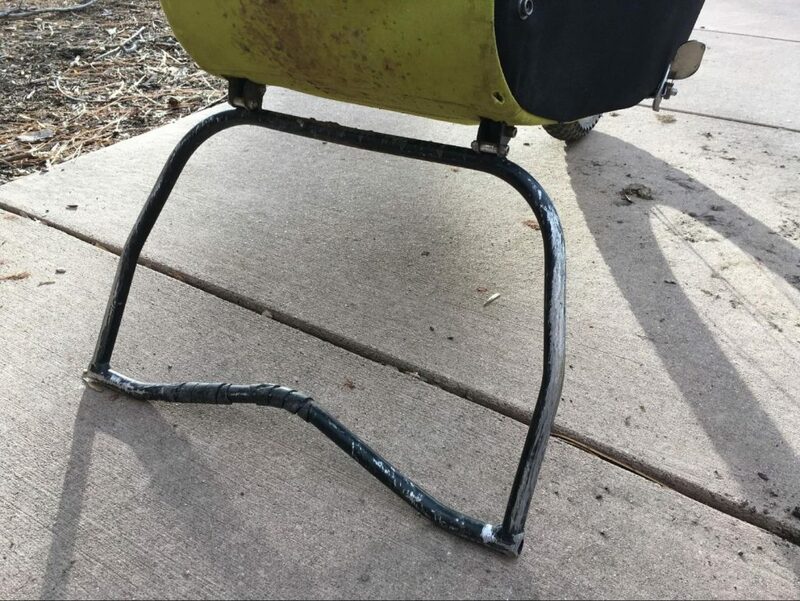 The leaning carriage creates a “wobble” or side-to-side pull on your bike’s seatpost. This could be very dangerous with high speeds, exposed ledges or rocky terrain. Fourth, is learning to ride your bike with the carriage attached. When the carriage leans, it pulls a bit on the seat post. You have to compensate by counter-leaning in the opposite direction, which takes some practice to prevent over-steering. 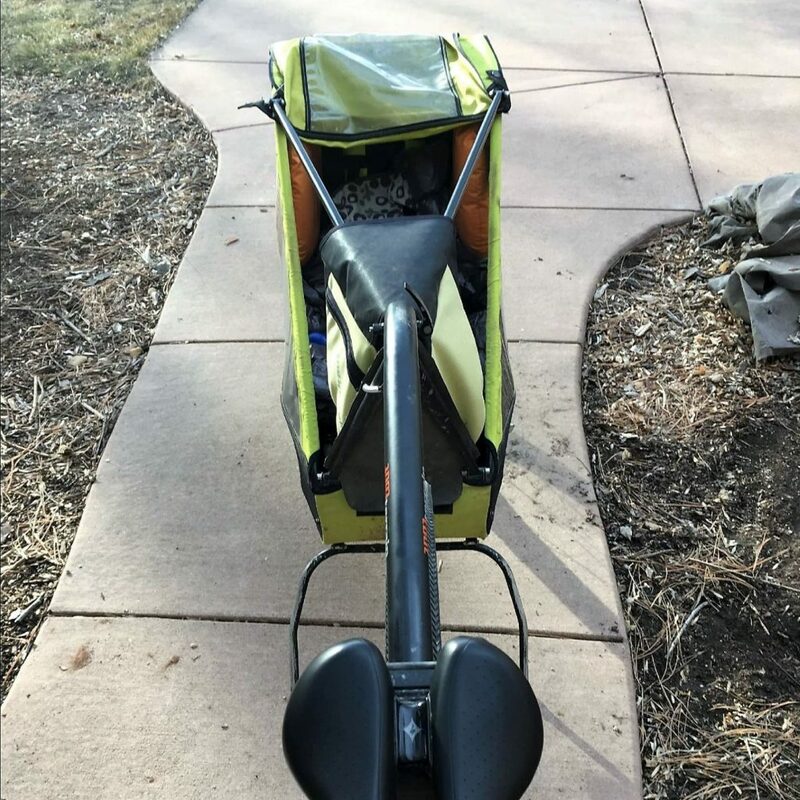 This can be improved by positioning the hitch lower on your seatpost and by ensuring the tow bar is attached properly. Also, sharp turns or switchbacks must be taken much wider than usual. Otherwise, the trailer can end up going off-trail or ramming into obstacles. Fifth, is pushing your bike with attached Singletrailer uphill or over rocks. Steering, balance and control require a good deal of strength and practice. In certain terrain, losing your balance and falling over could have dire consequences. The learning curves are a bit more challenging for smaller-sized people. 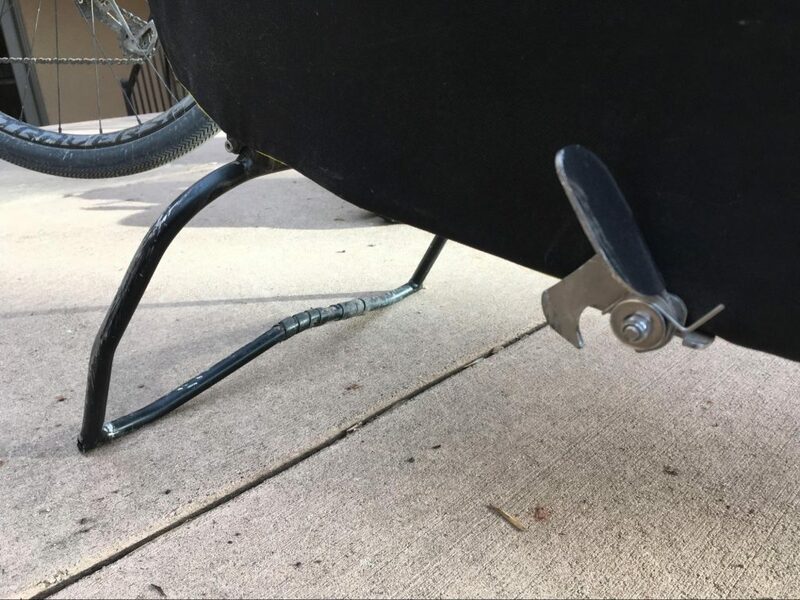 Small bike frames are at a disadvantage because the hitch will need to be attached high on the seatpost to keep the tow bar from rubbing the tire. This greatly impacts the handling of the bike by causing more wobble and side-to-side pulling on the seatpost when the carriage leans. Larger people may not find these learning curves to be much of a challenge at all. The carriage frame is made from CrMo steel that is light and durable. Our frame now has multiple dings from hitting and scraping rocks, but seems to be holding up without any issues. The trailer can fall or flip over fairly easy when you are standing still (the single wheel can be hard to balance). Ours was flipped over once by a gust of strong wind while parked on the side of a gravel road. Although scary, the passenger has not been injured in any way (she actually thinks its pretty funny). We attribute this to the child pillows that provide cushioning for both sides of her head and the steel carriage frame. The child seat is suspended and has an adjustable 5-point safety harness. The buckle of the harness uses a magnet system that is simple to fasten and unfasten. Our toddler finds it harder to nap because the seat does not recline much. However, she does recline more and nap better when we use the “short travel” setting on the carriage (thereby decreasing your ground clearance by 1-2 inches). The cover has a screen that helps keep out bugs and rocks, but not dust and small rocks. There is also a fully waterproof cover (I haven’t had a chance to test its waterproofness), which keeps out dust quite well, but does not permit adequate ventilation. During a hot summer ride, we had to get creative by putting ice packs under the seat to keep the carriage cool (and frequent stops for swimming in a nearby river). There is much less storage space in this trailer compared with our 2-wheeled trailer. However, Tout Terrain makes tw different sized Cargo bags (sold separately) that are adequate for carrying most things you will need for a day trip. The large size bag has a 9L capacity. Additionally, there is a good amount of space available under the child’s seat (at least another 9L). For our tikepacking adventures, we had to find ways to carry our overnight gear. Loops of webbing on the back of the trailer make it possible to attach a 9L handlebar bag. We used Velcro straps to secure tent poles to the Singletrailer frame. We have even seen people attach bags to the frame and tow bar. Keep in mind that the Singletrailer’s weight limit is 55 pounds. As far as storing the Singletrailer goes, it packs down small enough to pack in a trunk (although, still rather bulky because of the 1-piece roll cage). It packs simply and easily using quick-release levers. Parts break or bend and need replacing. If you do not pay attention, this could result in a serious safety hazard. Our tow bar got bent somehow and we are debating replacing it ($389) because it causes wobble. We have bent it back in shape enough to keep it functioning safely enough for now. It is important to regularly inspect hardware to ensure parts are secure and functioning. On one ride a nut nearly unthreaded itself from the screw that holds the pivots near the coupling together. If we had not happened to catch this, the entire carriage could have come unattached from the seatpost during use. After 1,500 miles of use, the kickstand and its latch are worn and the kickstand unlatches frequently during riding. This part cannot be purchased through the distributor and we are currently waiting to hear from the manufacturer (in Germany) about how to purchase replacement parts. The cover attaches to the carrier using elastic bands that have riveted snaps. These frequently fail, causing the snap to come off and need replacing. We carry large safety pins with us as a quick fix in case they fail during use. The manufacturer recommended a repair kit from Prym (Sport and Camping, 15mm, non-sew press fastener) found on Amazon for $15. It is relatively simple repair to do using this kit and a c-clamp. If you feel limited by your current trailer because you need to take your trailer on demanding terrain, then this product is highly recommended. It is pricey, but you can expect high-end performance. Be sure you have the know-how to be able to maintain it safely. If you need something practical, low-maintenance and affordable, the Singletrailer might not be best for you. Marie Walsh: From Fort Collins, CO where I practice family medicine. Mostly do endurance mountain biking events such as Colorado Trail Race, but have competed in XC MTB racing with some podiums at National level and a podium at World Championship level as well. Now, I’m trying to find that balance between a demanding job, being an involved mom/partner and my cycling. Follow my adventures on lmariewalsh.wordpress.com where I try to update whenever I can.